With demand for continuous connectivity driven by digitalization, using a single satellite service and antenna is not always the most optimal approach. 2018 was the year that Cobham SATCOM’s position as an Iridium CertusSM terminal manufacturing partner — since 2015 — came to fruition. After receiving certification for the new SAILOR 4300 L-band terminal in August, Cobham SATCOM’s first Iridium CertusSM terminal started shipping, ensuring that maritime early adopters of Iridium’s next generation multi-service platform are ready for commercial service introduction. Innovations, such as integrating the Iridium BCX module within the antenna itself, introduced significant benefits, including lower installation costs, more flexible antenna placement and optimized link performance. SAILOR 4300 L-band enables users to optimize diverse operational applications including; multi-user Internet/VPN, IoT and telemedicine, alongside regular usage including email, electronic forms/reporting and crew communication. Game-changing as a standalone, fully global communications platform, the deep integration between SAILOR 4300 and SAILOR VSAT will also enable service providers to upgrade their multi-band network services, enjoying a partnership with Cobham SATCOM as a single source of proven technology for all frequencies. Building upon the proven success of the market-leading SAILOR 100 GX system, the new SAILOR 100 GX High Power Fleet Xpress user terminal arrived in September. 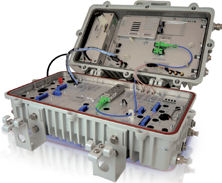 The compact 1 meter, 3-axis stabilized Ka-band system is specifically designed to enable Inmarsat’s newly launched high data rate plans packaged for bandwidth-hungry segments, such as Offshore Support Vessels (OSV), Global Cruise, and Superyachts. Delivering twice the RF power of standard GX terminals, SAILOR 100 GX High Power dramatically improves the economics of pushing large amounts of data from ship to shore, while also improving overall service quality and availability around the globe. The significant power boost comes courtesy of a fully-integrated, military-grade 10W GaN amplifier, which in addition to increasing upload speeds, facilitates a more reliable link to the GX satellites in all conditions to ensure continuity in the flow of mission critical data. As an additional enhancement to stability and Quality of Service, the SAILOR 100 GX HP system is compatible with Cobham SATCOM’s GX Antenna Diversity Solution, enabling two Ka-band antennas to be connected on a single GX modem unit, with SAILOR FleetBroadband, all on a single Fleet Xpress subscription. Only SAILOR GX series terminals enable dual antenna operation through embedded intelligent software, which eliminates thousands of dollars in costly rack devices and maintains the SAILOR emphasis on streamlined installation and activation. On land, Cobham SATCOM’s EXPLORER VSAT systems have been involved in several, high profile deployments this year. The EXPLORER 8100 Auto-Acquire, Drive-Away Antenna System, with its unique Dynamic Pointing Correction technology, has been installed on the UK’s leading-edge broadcast solutions provider Timeline TV’s new 4K-uplink RF2 broadcast truck. RF2’s first major project was the royal wedding of Prince Harry and Meghan Markle in May. Timeline TV’s crews used the system for operational communication over a high bandwidth, always-on Ka-band VSAT link, supporting the broadcast of what was one of the UK’s most watched events in years. The Government of South Australia’s Department of Planning, Transport and Infrastructure (DPTI) selected the 1.2 meter version of the same VSAT antenna — EXPLORER 8120 — to enable broadband data connectivity for workers delivering essential services to communities in remote areas. The EXPLORER 8120 VSAT systems feature the same Dynamic Pointing Correction technology, which ensures a reliable link to the satellite, even if the antenna is being buffeted by winds or people are moving around inside the accommodation unit. The EXPLORER 8120 systems were selected due to their easy installation and proven ability to deliver high uptime and were delivered in May 2018. In March of this year, Cobham SATCOM unveiled the unique Sea Tel 9711 Triband maritime antenna system, the world’s first and only 2.4 meter maritime stabilized antenna capable of delivering full gain performance across any C-, Ku-, or Ka-band network to maximize high-speed, high-quality broadband connectivity for demanding maritime segments such as Cruise, Energy and Government. The triband antenna system offers seamless, automated electronic switching between bands, providing unmatched operational continuity for vessels demanding the most bandwidth, reliability and coverage. Viasat has partnered with Cobham SATCOM to create a version of the Triband system capable of operating on their Viasat-2 satellite. The system will also support all other Ka-band networks in the future, including those operating in NGSO. Staying with ‘hybrid’ technology but on a smaller scale, it’s notable that Cobham SATCOM’s EXPLORER Push-to-Talk system, featuring unique PRISM (Private Routing & Intelligent System Management) technology, gained considerable traction this year. The system combines highly reliable global L-band satellite technology and least cost routing for automatic switching between SATCOM, LTE and Land Mobile Radio without user intervention. By seamlessly combining all available channels, the system significantly extends communications reach, providing high quality voice and data coverage even in radio blackspots. The migration by users of the first generation EXPLORER PTT to the second generation with PRISM technology after more than six years is testament to the significant safety and efficiency improvements possible for diverse users, from utilities field engineers to blue light emergency services. In November, Cobham SATCOM reported that the company’s advanced Ka-band TRACKER antennas deployed at Telesat’s Allan Park teleport near Toronto, Canada, are successfully demonstrating live, over-the air broadband connectivity on Telesat’s first LEO satellite. The Phase 1 LEO satellite launched in January of 2018 and is currently testing ground equipment and validating performance in an operational LEO environment. Cobham SATCOM provided 3.7 meter and 1.1 meter TRACKER antennas to test the satellite’s Ka-band payload, evaluate the capabilities of modems and other communications hardware in different service scenarios and to provide satellite tracking, telemetry and control (TT&C) services. The speed and stability of network traffic supporting latency sensitive applications revealed that Telesat’s satellite and Cobham’s antennas can deliver high performance, high quality data communications. With positive results at Allan Park, Cobham antennas could become part of a larger group of globally distributed landing stations as well as user terminals required to support Telesat’s fully deployed global LEO constellation, expected to enter service in 2022, especially as they offer such a powerful business case. Tangible CAPEX and OPEX savings including up to 90 percent reduction in energy consumption and better than 50 percent savings on installation time and costs are all possible with Cobham TRACKER antennas. For now, Cobham SATCOM’s diverse partners and users have plenty to look forward to from established Geostationary satellite services using L-, Ka-, Ku- and C-band frequencies. Antenna reliability and performance contributes significantly to Quality of Service, but delivering always available connectivity, especially at sea, requires integration of different platforms. It’s here that Cobham SATCOM will continue to forge its leading position as a single supplier for digital transformation enabling technology, with an extensive antenna systems portfolio covering all needs and offering easy integration for complete connectivity. 2018 will go down in the history books as the year 3GPP Release 15 was agreed upon — the first 5G standard is now a fact and equipment vendors and Mobile Network Operators (MNO) are scrambling to be first to market. Additionally, many adjacent industries are quick to chime in and want a piece of the action. Everyone seems to seek an association with 5G, and even technologies that are developed or standardized outside of 3GPP get a 5G label put on it such as NFV (Network Function Virtualization), SDN (Software Defined Networking) and ONAP (Open Networking Automation Platform) to offer a few examples. To fully understand and leverage 5G, it is important to understand and separate what outside forces are the enablers and the influencers to the standard, from what is included and currently standardized within 3GPP Release 15 and subsequent Releases. Thankfully, the satellite industry is actively participating in many important discussions around the development of future Releases. It may also be prudent to take a step back from the media frenzy that is already way ahead of the current capabilities of the technology and look at how 5G may influence your business through different lenses. Perhaps one view that takes a two to three year horizon and another that is more futuristic and considers use cases that may happen five to ten years from now. It is easy to get carried away by all the hype surrounding the new use cases that 5G may enable one day; however, we should not lose sight that things usually take longer than originally planned and sometimes the journey is more important than the end goal. For those of us who have lived and worked through previous standards being ratified, we may remember what ITU’s IMT-Advanced vision for wireless said about LTE back in 2008. For instance, the system should be able to provide 1 Gbps of throughput and there were plenty of exotic use cases being presented as key drivers for LTE and many of them never saw the light of day. However, if it hadn’t been for the introduction of the Apple iPhone combined with the new ecosystem and business models smartphones brought to market by destroying the walled gardens of the MNOs and allowing for applications and Over-The-Top (OTT) services to proliferate and be monetized through App stores, LTE would surely not have been the commercial success it is today. Innovation coming from adjacent industries is something that, many times, is needed to disrupt status quo and make a new mobile technology a success. And what about that 1 Gbps throughput? Well, we are 10 years past ITUs original vision for LTE published in 2008 and now there is finally a model of the iPhone supporting 1 Gbps of throughput. Yes, you read that correctly — LTE is fully living up to its name, Long Term Evolution. Ten years in and iPhone XS (this year’s new model) is the first Category 16 LTE (3GPP term for 1 Gbps capable user equipment) phone ever in Apple’s portfolio. Sometimes things take time to fully develop and mature and that is fine. This is about the journey as much as anything else, so try to rise above the noise and look for the path that is correct for your business when it comes to 5G. In mobile backhaul over satellite, the industry saw more growth in throughput than ever before and Comtech EF Data managed to accomplish a few world firsts. For instance, a GEO-based trunking solution for Internet and LTE backhaul surpassing 3 Gbps per link is now in service. That’s a number no one would had believed being possible to accomplish over satellite just a few years ago. Traffic continued to grow around the world as customers demand more 3G and LTE data services. This was particularly evident in Latin America where one MNO is now operating the world’s largest combined 2G/3G/LTE network over satellite backhaul supporting many Gbps of traffic over an HTS satellite supporting millions of happy customers and Internet of Things (IoT) devices. It is quite difficult to deploy a mobile network over satellite and make a decent return on investment when Average Revenue Per User (ARPU) are in the low single digits, but we are now witnessing that happening for good commercial reasons. This is something, as an industry, that we should be proud of accomplishing, as it is truly changing the world for the better. The United Nations published 17 Sustainable Development Goals for social and economic development and basically all of them can be accelerated and improved upon with the help of basic connectivity. Well done to all satellite companies out there for making this happen. Lastly, as we look back over 2018, it was a year where the second wave of non-GEO satellite constellations commenced with innovative new entrants such as Kepler joining the longer standing providers in the LEO and MEO market. Comtech EF Data has active projects for high-speed, real-time and low-latency communications and exciting projects on the horizon. Non-GEO has the potential to change the satellite communications landscape, and Comtech EF Data is proud to be at the forefront of this revolution. Richard Swardh is Senior Vice President, MNO, for Comtech EF Data. In this role, he leads the market development and direction for the 2G/3G/LTE mobile backhaul market, directing long-term strategic initiatives and defining solution suites and feature sets. A mobile network backhaul veteran, Swardh’s background includes strategic and operational positions at Ericsson with business development, partnership management and strategy execution responsibilities. He holds a Bachelor of Science degree in Mechanical Engineering and a Bachelor of Business degree in Administration and Logistics from Vaxjo University in Sweden. How do you prepare for a market where LEO and MEO SATCOM markets will not only flourish, but place new types of services and capabilities in the hands of a new generation of users? If you are Communications & Power Industries (CPI), you grow bigger, make strategic consolidations and acquisitions and focus on streamlined production and delivery systems. The past year has been a highly successful one for the new Antenna Systems Division (ASD) of CPI on several fronts. This was the company’s first year as the newly consolidated Antenna Systems Division, which was formed by integrating the activities of CPI’s two antenna divisions — the former Malibu Division in 2007 and ASC Signal Division in 2015 — under a single operating division. This effort was a significant undertaking and the synergies harnessed from operating as a single division have been substantial. Of particular note is that this consolidation better enabled us to unite the technological strengths of each organization in one, comprehensive offering for customers. For example, as ASD, the advanced millimeter-wave SATCOM positioner technology from Malibu Division was combined with ASC Signal Division technology to generate a new class of full motion tracking antennas for LEO/MEO SATCOM applications. The integrated Antenna Systems Division then used the large-scale manufacturing capabilities of the firm’s Whitby, Ontario, Canada, facility to move into full-rate production of these antennas for a prominent LEO customer. Involving all aspects of the newly consolidated division, this large program brought major benefits to production flow and overall logistics, thereby enhancing our time to deliver products to market. 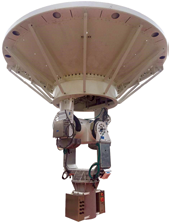 The experience gained through the development and deployment of the 3.5 meter satellite communications antenna enables CPI ASD to offer a rare, field-proven product of this size to address the growing LEO/MEO SATCOM market. In an effort to better serve the company’s customers in the GEO SATCOM space, CPI made a strategic decision to extend ASD’s product line with a range of new, large-aperture, Earth station antennas. In March of 2018, we acquired technology in March of 2018 from ViaSat, Inc. that allows ASD to offer customers new, larger antennas for the first time. These antennas range in diameter from 7.2 to 18 meters, can be configured for C-, K-, Ku-, X- and DBS-band operation and feature high-efficiency optics and precision high-rigidity mounts. ASD is in the process of integrating these larger aperture antennas into the firm’s existing product line, while making them compatible with industry-leading technologies. The new antennas may now be configured with ASD’s Next-Generation Controller (NGC); this controller receives a great deal of attention — and rightly so. This is a powerful, modular platform for controlling every aspect of antenna operation. The NGC can interface with a full suite of tracking technologies and also offers a wide range of features and options, such as an integral spectrum analyzer, a beacon receiver, transmit and receive chain-switching capabilities, system redundancy management, and carrier monitoring. In 2018, CPI ASD was strategically focused on growth in two areas: the company’s technology base and the expansion and strength of the expansive product portfolio. We continue to offer a complete range of products for any type of satellite, irrespective of that satellite’s orbit, and for any type of line-of-sight telemetry and common data link (CDL) application. This makes CPI one of the few antenna manufacturers to support such a wide array of applications. CPI completed several acquisitions that have furthered this goal over the years, as mentioned earlier in this article. In August of 2018, CPI grew the firm’s antenna technology and expertise for various space and satellite communication markets, strengthening the product portfolio with the simultaneous acquisition of Orbital Systems and Quorum Communications. These two related companies design and manufacture antenna positioners, as well as complete front-end systems that meet the high performance, accuracy and reliability needs of Earth Observation Satellites (EOS), direct broadcast (DB), telemetry and control (TT&C), UAV/RPV tracking, radar, search & rescue (SARSAT), and general satellite uplink and downlink applications. CPI’s acquisition of Orbital and Quorum brought the firm the designs for cost effective, high-quality full-motion antenna solutions for the satellite remote-sensing market, including microwave receivers, demodulators, downconverters and feeds. CPI ASD anticipates strong growth in these vertical markets over the next decade. With this acquisition, ASD offers a best-of-class antenna portfolio to address the demands of a growing customer base. In addition to the acquisition of key technologies in 2018, valued expertise and talent were attracted to ASD, as well. In March, Andre Jones joined CPI ASD as the company’s new Vice President of Business Development, bringing a wealth of knowledge in SATCOM systems engineering and sales and previous experiences in key senior executive roles at industry leading firms in the satellite antenna business. Andre is responsible for leading global business development effort,s while addressing the needs of the company’s strategic customer base. 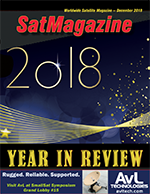 In 2018, in spite of a softer commercial SATCOM market, ASD’s business grew and had several key areas of success, particularly within the government and military MILSATCOM market segments, which remained strong during the year, and industry interest in our transportable, multi-band, SATCOM Trifold® systems is expected to continue. CPI ASD’s line-of-sight (LOS) telemetry systems and other unique products for MILSATCOM applications were also strong sellers. In addition, the firm’s air traffic control (ATC) radar antenna business saw a record number of systems being manufactured and the near-term outlook for these systems is rosy heading into 2019. ASD’s Data Link product line serves an important specialty market and business in this market remained vibrant in 2018. Our expertise in high-precision pointing/tracking has made ASD a recognized leader in this segment for advanced antenna systems for LOS applications in the global unmanned aerial systems (UAS) market, including some of the most sophisticated UAS platforms. These platforms include NATO’s Global Hawk AGS, Fire Scout, Shadow, Gray Eagle, Watchkeeper and ANKA. CPI ASD is extremely excited about ongoing opportunities in this market. Although the teleport industry is currently undergoing major changes with the advancement of LEO/MEO technologies, ASD believes that the teleport remains the most important link of any satellite communications network. CPI’s focus on innovation in our SATCOM business is critical to the firm’s, and our customers, future successes. The company will continue to develop technologies and products to support this strategy. For the satellite communications industry to remain relevant, it is imperative that CPI develop cost effective space and ground systems that operate efficiently and at the desired frequency bands to meet the growing demand for bandwidth. ASD is investing heavily in R&D, with a focus on technologies and products that permit efficient operation at higher frequency bands, including Q/V-band and higher. In 2018, CPI ASD prepared for the future of a dynamic market that will touch more and more vertical industries, with new fleets emerging to play a key role in areas as diverse as agriculture, broadband connectivity, and military and government applications. The company worked to develop the scale and technological depth that we believe will be needed as traditional GEO satellite operators, broadcasters and telecommunications companies adjust their business models to a hyper-connected world, including LEO/MEO and hybrid systems. In order to meet the demands of these complex architectures and business propositions, the company will continue to invest in the talent, the time and the capital to evolve our technologies and systems to ensure that CPI ASD customers can count on us across the board. Tony Russell possesses 35 years of experience in the RF industry, primarily within the airborne and maritime radar, ground and airborne communications and millimeter-wave science segments. Mr. Russell has been with Communications & Power Industries (and the firm’s predecessor) for more than 25 years, serving in technical and management roles in the firm’s electron device solid-state HPA and antenna businesses. Currently, Tony serves as the President of the CPI Antenna Systems Division. He has an Honors degree in Physics from the University of York (UK) and an MBA from York University (Canada). DEV can look back on an eventful and successful 2018 in terms of leadership and personnel changes, as well as expanded product lines, trade-fair exhibitions, international projects and alliances, and quality management progress. February 2018 began with an change of company executives. Manfred Mettendorff replaced Jörg Schmidt as Managing Director of the company that designs and manufactures a complete range of devices for optical and electrical signal transmission. Personnel advances at DEV included ramping up the firm’s its sales, marketing and customer service departments. 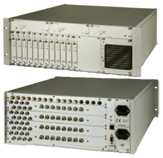 The new RF switching matrices DEV 1985 and 1975 have expanded the company’s portfolio that serves satellite and teleport operators. Increased demand for uplink data handling is met by DEV Systemtechnik’s new 16x16 combining matrix – the DEV 1975. This new, fan-out matrix for uplink applications, together with the new 16x16 distributing matrix DEV 1985, completes DEV’s range of matrices for arrays up to 2048x2048 channels, well beyond the firm’s popular 64x64 Archimedes matrix and smaller versions. The largest product innovation was featured at the IBC exhibition in Amsterdam: Alpha — the world’s densest RF-over-Fiber solution in one rack unit (RU) to emerge as the most cost-effective RFoF product line from DEV. Alpha consolidates an unprecedented 32 connections into one RU with function modules installed within a single 19-inch indoor or outdoor waterproof enclosure. Alpha supports fiber optic connections up to three kilometers in length and also offers redundancy options. For more distant and extensive functions, DEV Systemtechnik continues to offer its Optribution product line. The release of new products and solutions fueled further reasons why DEV could reflect on a highly successful trade-fair season. Complementing the company’s major presence at the CABSAT in Dubai, CommunicAsia in Singapore, ANGA COM in Cologne and IBC in Amsterdam, DEV also attended additional venues in Germany, the United States, China, Thailand and Japan to further expand international business opportunities. Notably, DEV has secured Optimum Viking Satcom India as its latest representative partner to promote and expand the burgeoning Indian market with the complete range of DEV’s RF equipment. Both firms will exhibit in January at Convergence India their products for SATCOM and broadcasting applications. Owing to DEV’s diverse portfolio of state-of-the-art technology, there were a number of major international flagship projects launched by the company in 2018. For example, DEV supplied two headends served by Austria’s largest cable network operator, with nine Distribution Amplifier Chassis (DEV 2190). These devices ensure that TV signals are reliably fed into the cable network. At the onset of 2018, DEV also activated a TV signal feed for a Television Receive-Only (TVRO) application in Germany using the firm’s Optribution RF-over-Fiber solution. This client also benefits from a 160 km. site diversity solution that boosts the reliability of its satellite network, despite atmospheric or weather-related effects. A customer in Hungary benefited from DEV Systemtechnik’s Archimedes Matrix Switch that offers unrivaled functionality. Beyond the integrated spectrum analyzer and Secure Lock Operation mode, redundant controllers ensure extremely high reliability in signal management and transmission. This Archimedes Switch serving 32 input and 40 output channels can be upgraded anytime in-field by the customer up to a 64x64 configuration. The Archimedes RF Matrix ​​also found favor in Asia, particularly in asymmetric configurations where it offers attractive cost savings. One large telecommunications company in Southeast Asia ordered a 32x80 matrix from DEV — the “Archimedes Cluster” — which can be upgraded in-field to handle 128x128 channels. An upgrade of an existing Asian Direct-to-Home (DTH) system introduced in 2006 was also on the “to-do” list for 2018. Through the extension and use of several Distribution Amplifier Chassis (DEV 2190), customer’s headend capacity has expanded to feed 200 additional channels into the TV distribution network. Capping DEV Systemtechnik’s 2018 success was the announcement that the company now offers a seven year warranty on all products, meriting industry attention for once again setting the bar in product durability and sustainability for transmitting high-frequency signals over coax and fiber. DEV’s quality management system was also officially certified to ISO 9001 standards by TÜV SÜD in February of 2018. This credential certifies that DEV applies an established quality management system for the development, production and sales of equipment and systems for signal transmission. In close cooperation with the company’s majority shareholder, Axing AG, DEV Systemtechnik will support the signal chain from teleport to end user. To serve the European-wide rollout of Remote MAC-PHY, the company supplies farsighted “state-of-the-art” technology for cable network operators. The extensive product portfolio of Axing AG with their optical nodes well complements DEV systems using the DOCSIS 3.1 standard. 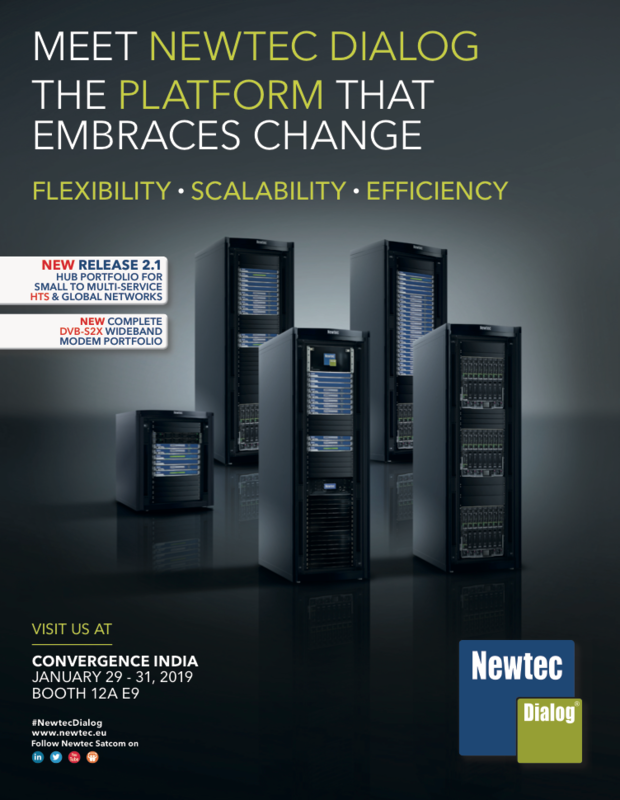 DEV will also showcase at 2019 conferences and trade fairs worldwide new product launches and solutions. Tom Keim studied economics in Germany with a master’s degree and has been Business Development Manager of DEV Systemtechnik GmbH since 2017.